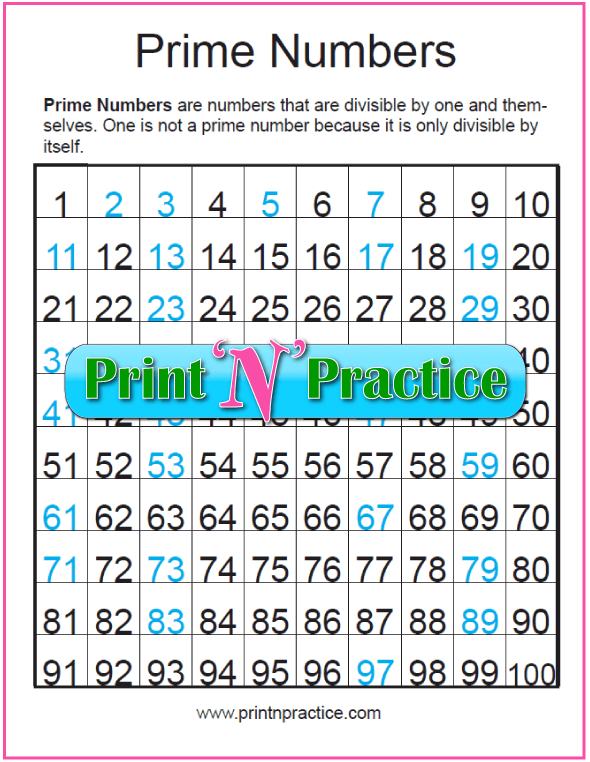 Prime Numbers Chart: Awesome Printables! Prime Numbers Chart: Prime numbers to 100. 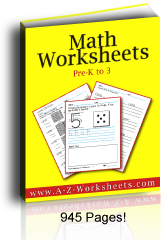 Four great worksheet printables. I like to keep a printable prime numbers chart handy for factoring. Below I have a list of prime numbers to print that you can keep in your or binder. Then have your students fill in our blank chart so that they can practice learning the main prime numbers and see the difference between prime and composite numbers. After that, I like the kids to keep a copy in their text book or notebook. The first 100 prime numbers are more than enough for most elementary and high school applications. 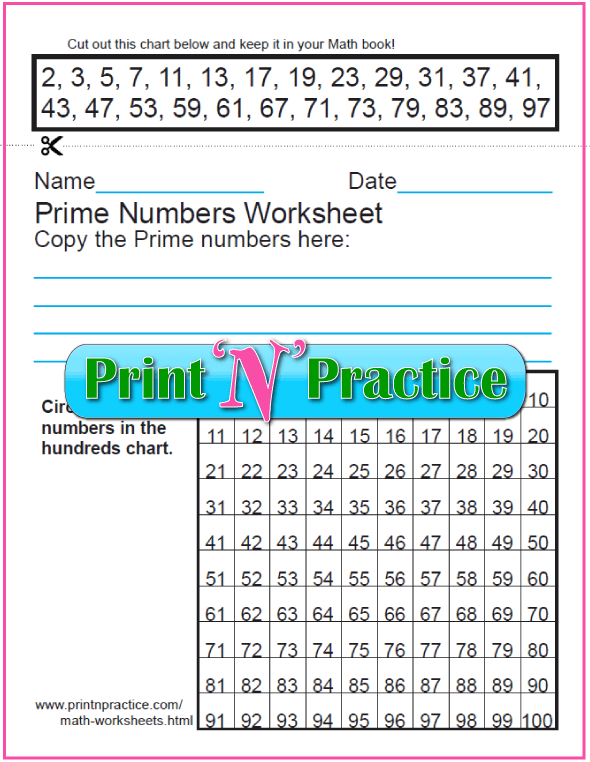 We also have prime number worksheets below. 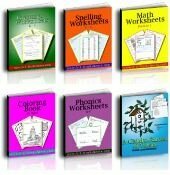 Once your kids have seen how the first primes are found, the easiest way for them to tell whether a number is prime or not is to be able to reference a chart even if they only write the first 12 to 25 in their books. I was so glad to read that Wikipedia says this, "There is no known useful formula that yields all of the prime numbers and no composites." I had always wondered "How to figure primes" as a child, and I had also wondered again as our children began to learn. I couldn't figure it myself, so, as they went through school, I began to have them keep a chart in the front of their books so that they could have their own list of prime numbers handy instead of us trying to figure each time. Each time they figured a new prime, they'd write it on their list. 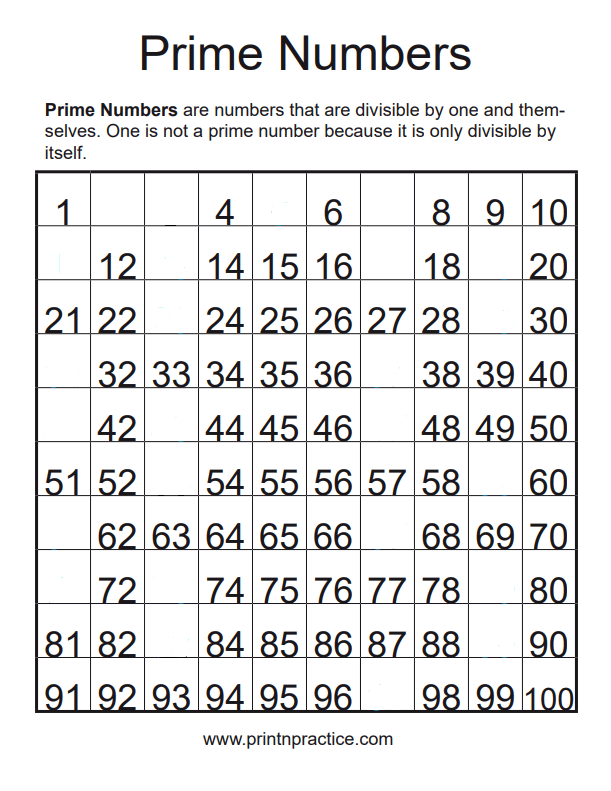 You can print these prime number charts on card stock to keep for reference in your Math book or binder. The first prime numbers chart has the 25 prime numbers that are in the first 100 numbers (in sequential order: 2, 3, 5, 7, 11, 13, 17, 19, 23, 29, 31, 37, 41, 43, 47, 53, 59, 61, 67, 71, 73, 79, 83, 89, 97). Except for the number 1, the composite numbers are black and the prime numbers are light blue. They can be traced for a quick memory exercise for small children. Use it as a poster or as a worksheet. The second is a worksheet. 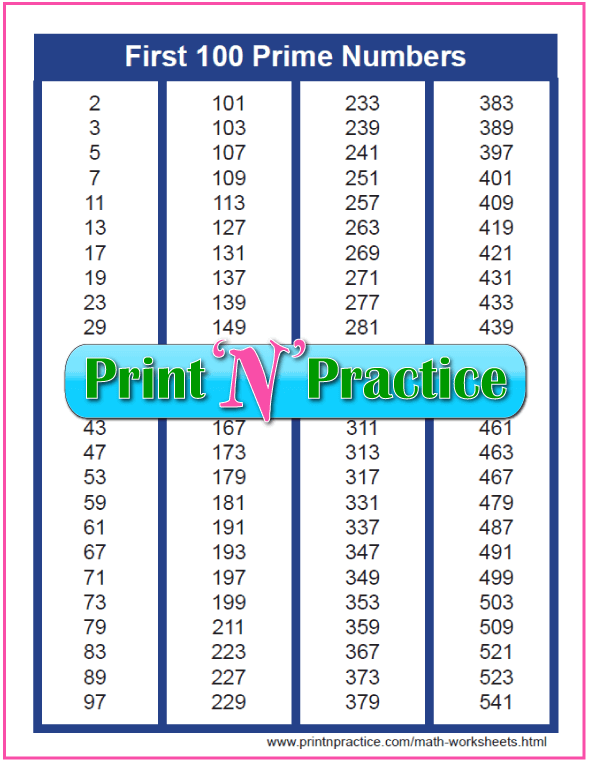 The next is a prime numbers worksheet with a small chart to cut and paste in a book or use as a bookmark. I like keeping ours in the front of our text books. The first primes are easy to memorize. If you'll teach your students to memorize the first of these, they'll have an easier time with factoring numbers. Just practice a few times out loud and most students will be able to recognize the primes in a week. I like to have them copy the list to the inside covers of their Math book or notebooks. This acts as a review and as a reference. I would not ask them to memorize more than those in the first 100 numbers. Why not memorize more than the first 100 prime numbers? Way back in Greece, about 300 years before Christ, Euclid said that there is an infinite number of prime numbers, so there is no sense in trying to learn a large number of them. Today you can search for a prime number tool or a prime numbers chart online, or find a computer tool, which is so much easier. Keeping a chart handy, though, obviates the need to research or key up the computer. I agree that, at first, it is good to have children figure whether a number is prime or not, but once that's figured and they understand; there's no need to re-figure the prime numbers for every single Math problem. It's much easier to keep a prime numbers chart, or a prime numbers list, handy. See my primes charts in PDF format above. Prime Number Definition: A prime number is a counting number that is greater than 1 and has only two factors; 1 and itself. The first primes are 2, 3, 5, 7, and 11 because their only factors are 1 and themselves. You cannot divide them by any other number to get a whole number for an answer. There are 25 prime numbers on a 100s chart which is usually plenty for being able to discern which are prime and composite numbers. See our printable hundreds charts below. I was taught, or perhaps I wrongly remember, that 1 was a prime number. I guess 1 is not a prime number. Here's what I've found. 0 is nullity. 1 is identity, it only has one factor. 2 is the only even prime number (think about it, all the other even numbers are also divisible by two making a third factor). Primes have only two factors, and composites have three or more factors. See them both on our prime numbers chart below. A composite number is a counting number that is greater than one and has three or more factors, it has at least two prime numbers and 1 as factors. 4, 6, 8, and 10 are also divisible by 2 as well as 1 and themselves so they are composite numbers, meaning that they are composed of more numbers than one and themselves. 6, 9, and 12 are divisible by 3 so they are composite numbers, too. Prime factorization is finding the prime factors in a composite number. The prime factors of 100 are 2 x 2 x 5 x 5. With the right start, factorization can be like a game. It can be fun for some kids. At first, it is really good to show your students how prime numbers are found. If you've got older students, go to Wikipedia to show them some of the formulas that have been developed over the years; but younger students simply need to see that primes only have 2 factors, 1 and the number. Leave 2 since it only has two factors, then cross out all the numbers that are divisible by two which is every other column on the chart. Leave 3 since it only has two factors, then cross out all the numbers that are divisible by three. Leave 5 since it only has two factors, and cross out all the numbers that are divisible by five, which really only means to cross out the fives column since the tens are crossed out by the twos. Leave 7 since it only has two factors, and cross out all the numbers that are divisible by seven. All the rest of the numbers are prime numbers! Circle them and copy them to your notebook to make your own prime numbers chart. There are only 25 on a hundreds chart. See our printable hundreds charts here. Dan's got a wonderful website with a handy prime number checker. Go to Dan's prime number calculator here.